Miss Bernice continues to heal and to charm. There is very positive news on what has been a matter of some concern. Otherwise, we see her on video in attendance at a hospital staff meeting, and posing for pics. Miss Bernice continues to heal and to charm. There is very positive news on what has been a matter of some concern. Otherwise, we see her in attendance at a hospital staff meeting and posing for pics. 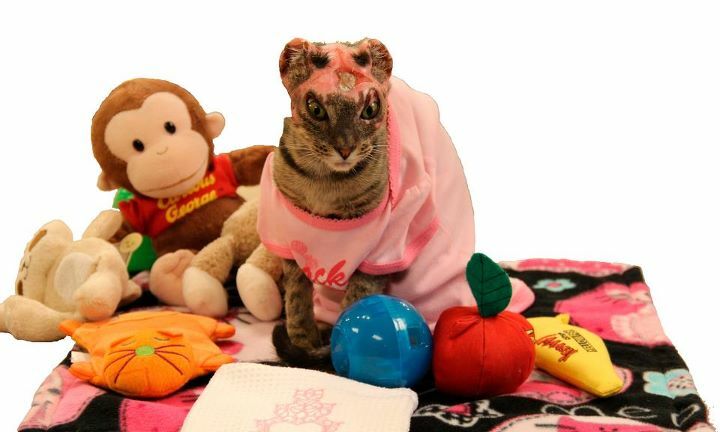 Bernice, the cat found severely burned on the street in Oshkosh WI this summer, and who now lives at Animal Hospital of Oshkosh as she heals, has garnered herself a huge cult following of devotees who are all rooting for her recovery. Like others whose stories we we have come to know, Bernice was given the chance to live when her condition looked grim; she was given the chance because she showed herself to be a fighter and a warm, loving soul who could touch hearts. We have seen her go from a prone figure in mummy wraps, to a nearly bald little figure taking halting steps, to a loved and loving cat who has rediscovered comfort, play and friendship. She is still medicated for pain, still healing, and still has far to go, but her progress in less than two months is amazing and inspiring. As Bernice makes great progress toward healing from her burn injuries, tightening scar tissue has become a concern. As scars heal, shrinkage causes tightening, and that tightening could possibly impede freedom of movement to a degree that would greatly impact Bernice’s quality of life. 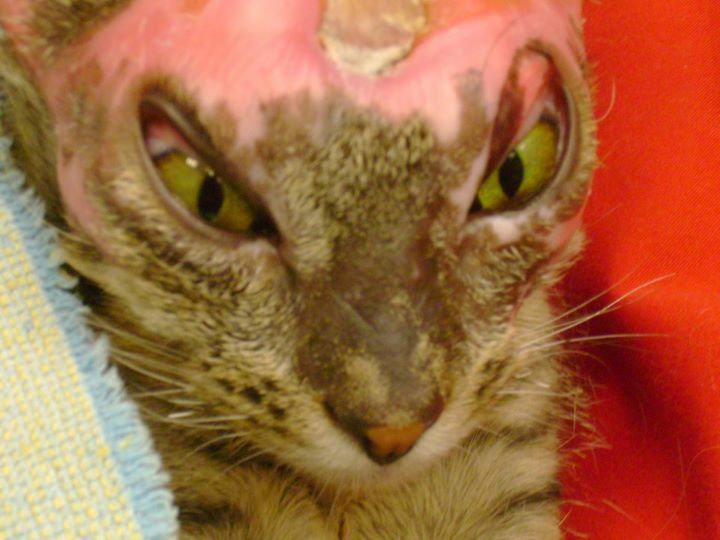 Because the burned areas are so extensive, skin grafts are not a likely solution to the potential problem. The good news development is that, according to a consulting surgeon, Bernice has so much new stretchy skin that it can be pulled and used to help compensate for the problem tightening. A note published by Aimal Hospital of Oshkosh says “Bernice has so much new, healthy, stretchy skin that she (the surgeon) was able to remove the tight band of scar tissue over her shoulder areas extending down her sides toward her elbows, and then close it. If this area heals as we hope it will, it should give her much more freedom of movement. How much movement… only time will tell. There is more scar tissue in this area that can be removed if need be, and there are a few other areas of tight bands that the surgeon would also like to reconstruct/remove once we see how this surgery heals. Although there is a chance that we may still need to do skin grafts in the future, I am hopeful that we either won’t need to or that the number of grafts will be limited. Her eyelids will be addressed at a later date by an ophthalmologist. Bernice and hospital staff in a video from 9/7. Bernice 9-7-2011 from Brad Gehrt on Vimeo. Note: If you get an error message on the video, try refreshing your screen; that should fix it. Ahhhhhh…look how beautiful she is! The continued improvement in her skin is very encouraging and her walk looks so much better too! Have you tried putting Vitamin E on her healing skin? bless her. she looks great and seems to be walking better. keep it up pretty girl!!! thanks for the film! She keeps looking better and better with each update and I’m sure that she’ll continue to continue that upwards trajectory. We’re all rooting for you Bernice! Its so nice to see little Bernice up and moving around and boy didnt she love that chicken!! This put a wonderful smile on my face im so pleased she is doing so well,what a little fighter she is. Love you Bernice!! 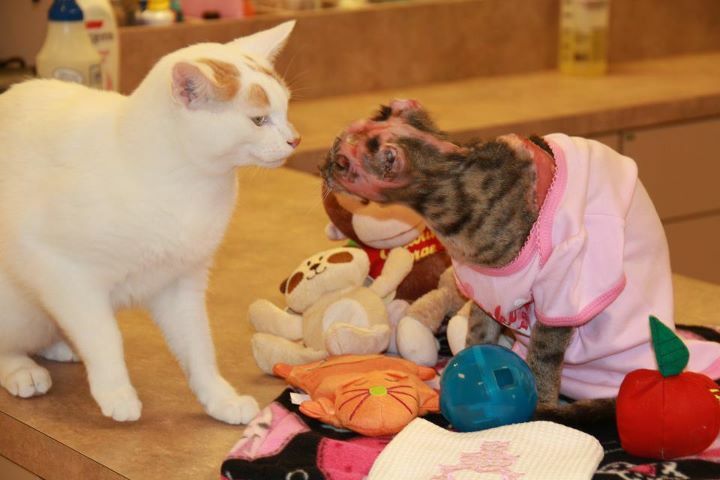 So good to see normal curiosity and movements, if a little scratchy from her healing skin. You are all doing such a wonderful job with her. What a loverbug!!!!! I Love watching updates on beautiful Berneice What a gorgeous lady! !